2017 is underway, which means it’s a new year of junkin’ journey road trips! To kick it off, we recently headed down the highway to do some shopping in Columbia, SC. Now, Columbia isn’t all that far away from me…and I don’t really know why I waited so long to explore the vintage/junking scene there! 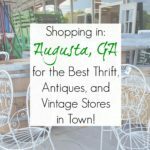 Because there are some really amazing antique stores, vintage shops, consignment shops, and thrift stores in Columbia, SC. Speaking of which, ready to see where I went and what I loved? Of all the antique stores that were recommended to me, this is the one store that had universal praise. So, not only did I put it on our itinerary, but we hit it the moment we rolled into Columbia, SC. And let me tell you, we were NOT disappointed! I loved just about every booth in this shop- which is a nice size (not too big, but not cramped and cluttered) AND wonderfully curated with a blend of primitives, MidMod, cottage-style, and all-around funky. I’ll DEFINITELY be returning here whenever I’m in town. The Old Mill Antique Mall is a pretty famous antique store in Columbia, SC…and was by far the most crowded of any of the shops we visited. If you go, set aside a lot of time because there is a LOT to look at here…two stories filled to the brim with everything you can imagine. I do, however, highly recommend parking in the back and checking out the connected furniture repair shop- that’s where I found every single treasure we took home from Old Mill! Full disclosure- I’ve been to this antiques store in Columbia, SC several times before! In fact…Ivy House is how I met Restoration 41, as I purchased a dresser from her…which appeared in my very first blog post. So, I have effectively come full circle! 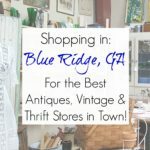 BUT, back to the shop…Ivy House specializes in shabby chic/cottage and retro treasures…so if that’s your game, then it should definitely be on your Columbia, SC shopping itinerary. My favorite booth, however, was That Vintage Vibe– her retro style is so enviably cool! So…I usually shy away from consignment shops, simply because they rarely have genuine antiques/vintage “stuff”. But…I took a gamble on this shop (based on their Facebook page photos) and ding, ding, ding- we have a vintage winner! I absolutely LOVED this consignment shop in Columbia, SC and would put this near the top of my list whenever I’m in town again. Now, it wouldn’t be a junkin’ journey if I didn’t hit at least one animal-charity-based thrift shop, right? So it had to be St. Paws, a longtime favorite of mine. While they have plenty of clothing, I always go for the housewares…and there are usually plenty of older treasures tucked in here and there…just waiting for me to find them! That’s why this is one of my favorite thrift stores in Columbia, SC. 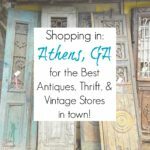 As you know, stores open and close all the time- and at the time this was written (January 2017), these were my favorite antiques, vintage, consignment shops, and thrift stores in Columbia, SC. Now that several years have passed, I’d love to hear your thoughts. 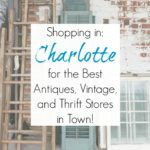 Are there new antiques stores or thrift stores in Columbia that I should check out? Always, always fun to read of junkin’ journeys. Thanks for sharing! I haven’t been to Columbia in ages! I’m from York,SC. 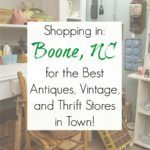 Going to Belmont, NC today antiquing! Fun!!!! I’ve been to Clover and York, cute little towns! Thanks for taking us along on your junkin’ journey! You are so very welcome, Kat! Virginia is close! Come to Norfolk. I know a few places but I.m not aware of any that support animals and wish I did. I will look into that! Thanks for that bit of information! I’m thankful that you are paving the way, so to speak. 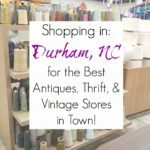 I live in southeastern NC, and I have traveled to visit Donna of Distressed Donna Downhome in western SC for some junkin’ pleasure. I also have a cousin in Columbia that we visited while in that area. We didn’t go to the thrift/antique stores in that area, though. Now, I have a good reason to visit that area again. I have been mapping out my area. Hopefully, I will be able to share that information when I get a new blog started. Soon, I hope. You would have a wonderful time. She’s a sweetheart! Thanks so much for coming to Columbia and sharing about some of my favorite places!!! Sorry that I missed seeing you, but next time you’re in town, I’d love to treat you to lunch!!! We definitely need to catch up- I’ll definitely have more time next go-around when I’m not hustlin’ from shop to shop. So it is a date!! Was so happy when I turned on my computer and saw that you had gone on another junkin’ trip. I went and got a cup of coffee and got ready for the trip. I have made notes and a list of the shops that you go on each trip. I was so happy when you got in South Carolina. Can’t wait for the next trip. Go to Virginia and hit the back roads or you can save those for the Fall. The mountains, not the beach side. Thanks and let’s go. My favorite in Columbia is Old Mill. I see a couple I have passed by in recent trips. I am still awaiting riding the Ridge with you. Have you been to Statham, Georgia? They all look like such wonderful places to explore! Lots of goodies that I would have to let come home with me! I live in West Columbia, SC and love to go junk in’. You gave me some great ideas for several places I haven’t visited. Thanks! I’m so glad, Mary Sue! Happy junkin’!! Thanks for sharing. I now a junkin rush. Definitely putting this trip on my list. We’re building a house (ack!) And I’m looking for vintage style sinks and tubs…any recommendations? We live about 30 min out to Columbia, but would love to take a little trip if its worth the drive :). Thanks! Are you looking for vintage-style? Or actual old pieces? Unfortunately, I have no idea about “new” products, as I buy secondhand whenever possible…sorry! !